It was so easy to make No-Knead Bread: 3 cups flour, 1.5 cups water, a teaspoon of salt, a pinch of yeast–put it in a bowl, stir, and wait. 18 hours later, you have dough ready to shape into a loaf. According to one of my collaborators, the worst home-baked bread is better than the best supermarket loaf. But on days when the dough is too sticky to handle, or the resulting loaf feels like it might be better for holding open a door than making sandwiches, I wonder. I believe he’s right in principal, but I wish the bread could be a little more consistent from one loaf to the next. I wish it could be as perfect as those biscuits were. Oh, right. Maybe scoop-and-level isn’t the best plan at bread-baking time. “No-knead bread by weight,” I typed into Google, and the first link on the result page gave me what I wanted to see. 430 grams of flour, 350 grams of water, 8 grams of salt, 1 gram of yeast. That’s not quite as memorable as 3-1.5-1-and-a-pinch, but I’ll find a way to remember it. I found the scale on the first try, pressed the unit button to display the metric measurement rather than English, and scooped away, watching the numbers. Zeroed out the scale and added the salt. Another zero for the yeast. And then the water. Stir. Maybe the expectation of the result leads to the result; maybe I was fooled by what I wanted to see, but this batch of dough looked good already. I covered it and went about my day. Morning came; time for the first shaping. The dough did not say, “Dude, this is going to work out,” but it looked terrific, and shaped easily and without mess. Two hours later, and it looked even better. I’d like to say that the perfect little dough ball went uncomplainingly into its pre-heated pot, but it was a little sticky on the bottom; still, nothing like the problems I’ve had in the past. An hour later, the loaf sat on a bread rack, its golden crust looking exactly like I’d hoped it would, and surprising me with little crackling noises as it cooled. Eventually the loaf was cool enough to cut. The crust was delightfully crisp; the crumb sturdy but soft. There are a few air pockets, but smaller ones than scoop-and-level gave me. 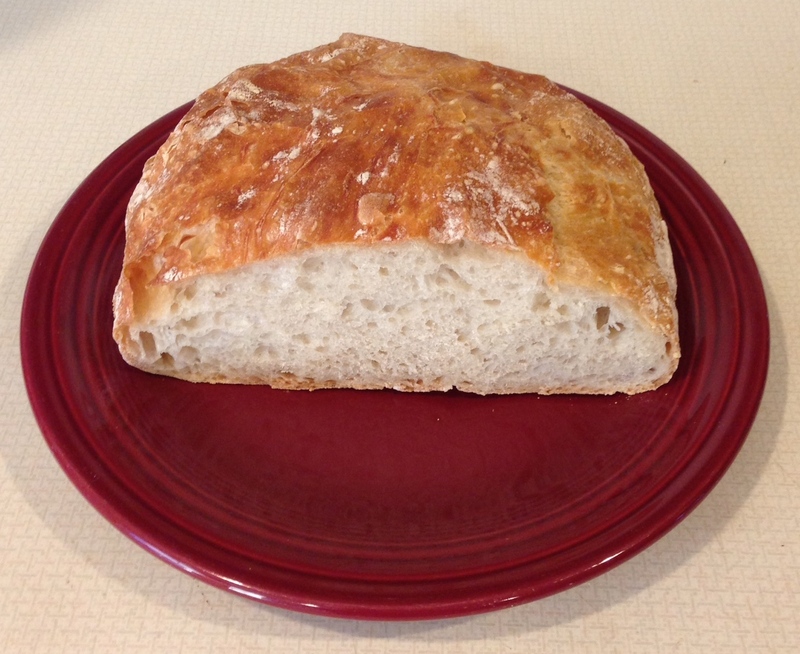 And, most importantly, the bread is delicious–dangerously close to being good enough to eat a loaf all at once. It might be that the baker who first described the no-knead method can get consistent results with volume measurements. I’m willing to bet he can detect variations from one batch to the next and make adjustments without any difficulty at all. But he bakes bread all day long; I bake one or maybe two loaves a week. I’m still an improviser at heart, but not when it comes to this bread recipe. From now on, I’ll do it by the numbers. No-Knead Bread, the next morning, after a slice for a snack and preparing an egg-and-cheese sandwich for her breakfast.